Your Ultimate Guide to Frenchmen Street Jazz - Find the Best Jazz Clubs! There are three certainties in the city of New Orleans: if you don’t like the weather just wait half an hour and chances are it’ll be different, potholes, and some of the most constantly amazing jazz music you could ever hope to hear. Tucked away, past the crowded streets of the French Quarter, through the sea of tourists holding neon green cups, filled with questionably legal amounts of alcohol, sits a street famous for being THE jazz destination: Frenchmen Street. In this short street located in the Faubourg Marigny, a quaint, unsuspecting neighborhood in the heart of the city, you will find the home to some of the most talented jazz musicians in the world. This is a street where the music never stops with live shows seven days a week year round. You can trace jazz back to the early days of the city from the sounds and music brought over to the North American colonies by the slave trade. In 1685, France’s King Louis XIV passed a decree known as Code Noir. This was an attempt to secure France’s influence and sovereignty across all of the colonies. Even though the Code gave slaves Sundays off, it was still illegal to gather in public. This sparked several movements to gather in private and remote locations. The most famous area is now known as Congo Square. In 1817, Congo Square (then, called “Place Publique”) was declared by the city the only area in which enslaved Africans could legally convene. Because of this, it became a hotbed of African and Creole music and trading. Slaves could buy and sell goods in the markets, including their own freedom. Every Sunday, people would flock to Congo Square to gather, trade, and play music, often with a smattering of improvised instruments like washboards, jugs, and home-made drums. Thanks to the extensive diversity of the city, due to it being a major port town, the rhythmic African music was soon combined with the use of European, Cuban, and Creole sounds. Along with incorporating hymns and prayers into what were eventually known as “spirituals”, these sounds and lyrics formed the foundation on which jazz could grow from. One of the most recognizable features in jazz is what is known as “call-and-response” which was influenced by Cuban and Caribbean music. Soon after the abolition of slavery in 1865, newly freed African Americans couldn’t find much work due to the stringent and oppressive segregation laws of the time. Many went on to find work in entertainment playing music or dancing in clubs, bars, and restaurants all around the city. William F Grimes is a professor of music at Louisiana State University, as well as a notable jazz bassist. He teaches a class at LSU on the history of jazz which also serves as a course in jazz appreciation. Bernard de Marigny, a Creole businessman and Louisiana politician, owned a swath of land downriver from the French Quarter. When it came to stereotypes, de Marigny was the definition of a true Creole. He loved parties, festivals, music, and just an overall joy of life. This is that joie de vivre that Creoles live by. He also loved gambling. de Marigny brought over from England a game known as Hazard, or locally known as Crapaud. Today, you might know this game as Craps. He also founded the Fair Grounds Race Course (then known as the Louisiana Race Course), which is home to the world-famous New Orleans Jazz and Heritage Festival. Of course, his love of dice came at a cost. Wracked by gambling debt, de Marigny was forced to parcel out his family’s large plantation and plots of land which led to the creation of the Faubourg Marigny. This didn’t deter his joyous nature or larger than life outlook. Even after having to sell off his family’s land, he still named the streets after less-than-conventional things like Peace, Greatman, Goodchildren, Desire, and of course, Frenchmen. Frenchmen Street has become a major destination for both tourists and locals. The modern-day Frenchmen began in the 1980s as a response to the ever-growing and often over-touristy Bourbon Street. Peppered along just a two-block section of Frenchmen Street between Esplanade Ave and Royal Street, you will find the city’s top destinations for anything jazz. The Maison (508 Frenchmen) has become one of the top clubs on Frenchmen Street when it comes to jazz. Home to three floors, fantastic food and drink specials, and music every day of the week, it’s no surprise to hear it’s an easy favorite among locals. Moving down the street, tucked away almost inconspicuously, you’ll find the Blue Nile (532 Frenchmen). Often claimed as the place where music on Frenchmen Street started, the Blue Nile is one of the oldest music venues in the Marigny. The second floor is a must-see and features a balcony that allows the party to flow into the streets. Even though it’s one of the younger clubs on Frenchmen, d.b.a (618 Frenchmen) packs a mean punch. Whether it’s the large selection of beer, wine, and cocktails, the beautiful cypress wood interiors, or the impressive talent that is on constant rotation, you will want to stop here on your next trip. That brings us to the two big hitters, The Spotted Cat (632 Frenchmen) and Snug Harbor (626 Frenchmen). When it comes to jazz, there really is no better place than either of these clubs. If you only have time for a couple of stops, these need to be number one and number two. Jazz and New Orleans are as natural as red beans and rice. A perfect blend of flavor, culture, and identity that you couldn’t imagine having one without the other. Jazz’s roots grow thick and deep throughout the history of the city, entwined within the very fabric of our identity and culture. It has helped shape and form a cultural force known around the world and draws people into our small port city by the droves. 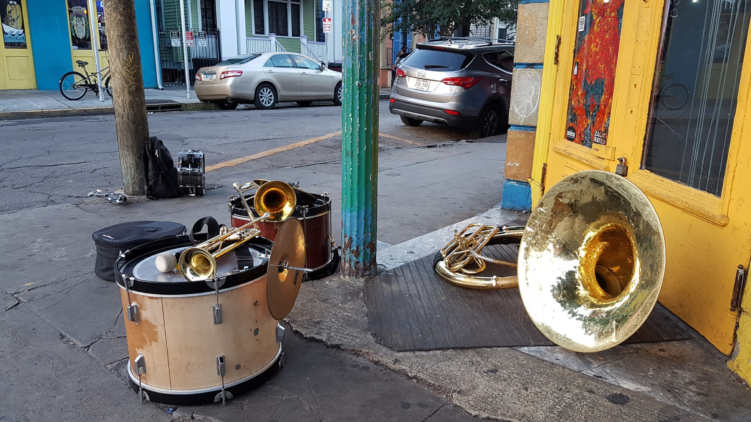 Next time you’re in the city, you best make it your top priority to get down to Frenchmen STREET, and experience the sound and soul of the city.